Barely over the last world war, a special mission began to travel all over the defeated Germany. Publication of the reports of these missions has shocked the scientific world. For 12 years of existence of the Third Reich Germans behind the Americans in the creation of the atomic bomb, but has created a ballistic missile, which had no equal neither in America nor in the Soviet Union. They didn't know the radar, but created equally efficient detectors of infrared rays. Although the Germans did not invent silicones, but has developed a completely new organic chemistry (vospitannyh links carbon). And their cosmogony stunned astrophysicists rest of the world. It was the theory of eternal ice, where planets and stars were icy boulders floating in Space! What was the reason of such development of scientific thought in the Third Reich? 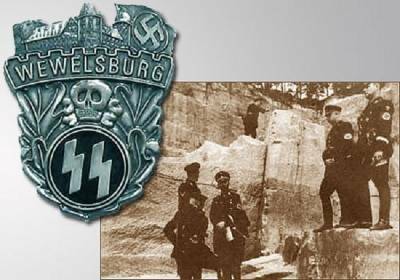 In the 1920-ies in Germany, there were several secret organizations, today known as "the Thule Society", "Society Vril" and "Ahnenerbe", All of them became part of the senior SS and had a huge influence on the ideology of the Nazis. But now it will just about "Ahnenerbe". So, 1933. Besides Hillshire and dare, in creating the "Ahnenerbe" participated and Karl-Maria Villigut (Vaskor), which had a huge impact on the Reich-sporera-SS Heinrich Himmler. Villigut worked in "Ahnenerbe" from 1933 to 1939 and headed the Department of prehistoric research. In 1939 he resigned. Himmler did not spare funds to Finance the work "Ahnenerbe'1. Louis Pavel and Jacques Bergier argue that, in General, on secret investigations took more than a creation of the first atomic bomb in the United States In his book they write that "this research covering a huge area, from scientific activity (it "Ahnenerbe" supervised the project "the Weapon of retribution" and in particular the programme V") to study practical tanazania". However, on the General background "crazy projects" stood out several priorities. The first direction steel archaeological research. The greatest popularity in this sense has been the search heritage of the Cathars of the Albigensians. The history of these persistent searches connected with the name of the Otto, in fact, historian-taught and "the black archaeologist". Otto RAS since the childhood was fond of mysteries of the Albigensians. The underground galleries of Montsegur, the last stronghold of the Albigensians at the final stage of the hardest war Crusader armies of Sezona de Montfort against "Cathar heresy", and the legendary shrines, hidden somewhere in these caves, gave him no peace. But the thing is that in "Nordic" interpretation Montsegur was equal to the hill of Salvation, where was the Holy Grail. Therefore, the projects of the Otto been sympathetically received by the Nazis. In 1933, shortly after coming to power of Hitler, saw light the first book Wound on "Crusade against Grail". In Nazi interpretation of the Holy Grail got the image of the Bowl of the Nibelungs (Nordic shrines), and themselves-Albigenses Cathars were announced by the people from Franconia, almost Germans. In may 1935 Otto Russian Academy of Sciences became an employee "Ahnenerbe" and a year later he received the title unterer-Fuhrer SS. Soon he released his second book "Servants of Lucifer". However, after much-publicized trip to the Languedoc in 1939 Otto RAS suddenly disappeared. From France departed, Germany has not arrived. After the war, he never showed up. In June 1943 in Montsegur arrived scientific expedition organized "Ahnenerbe", which included the famous German historians, ethnographers, geologists and cavers. The expedition broke camp and began work in caves. Research in Montsegur continued until the spring of 1944, then they hastily turned off, because I had to escape advancing enemy troops. We have to admit, "Ahnenerbe" cleverly worked all over the world. There is nothing strange therefore that such an awesome mystery how the crystal skull, attracted the attention of the Nazis. In 1943 in Brazil were detained agents "Ahnenerbe"trying to Rob the local Museum. During the interrogations they showed that arrived to South America on a secret ship Abwehr yacht "Passim" with a special task: to find the "remove" crystal skull "Goddess of death". With the same job here were abandoned several groups. It is not excluded that some of them did succeed. Why crystal skull took top secret elite group? The Reich protector of Villigut was considered "the carrier of the knowledge of the devil", but the magic of Indian priests heavily involved in cults death. By his order Emissaries "Ahnenerbe" and careered around the world in search of ancient esoteric knowledge, archives and magic details of secret societies, but especially drew their attention to Central and South America, because this is where they expect to find traces of knowledge of the priests of Atlantis, "the progenitor of the Aryan race". The Nazis hoped with their help not only to create the Superman, but to subjugate the rest of the inhabitants of the planet. As for the crystal skulls hunted especially actively, because there is a hypothesis that they were made in Atlantis and had a special purpose. Another favourite activity "Ahnenerbe" was held expeditions in remote areas of the globe to establish contacts with representatives of ancient civilizations. First of all, the Nazis were interested in Tibet. In 1926 in Berlin and Munich appeared strange colony of Tibetans and even existed "Tibetan society". Karl Haushofer (scientist-geopolitician, which had a huge impact on the Outlook of Hitler and the ideology of the Nazis in General) often inflicted visits there. It was on his initiative was organized several large-scale expeditions in the Himalayas. Haushofer wanted not just to conclude an Alliance with the secret rulers of Tibet, NGOs and benefit from their input in solving complex strategic issues. It even went on organization of direct communication with the Dalai Lama. The direct management of the expeditions carried out sturmbannfuhrer Ernst Schaeffer. It was established in Tibet numerous contacts with monasteries, and even brought in Munich "Aryan" horses and "Aryan" bees for study and cultivation in Europe. In addition to anthropological studies, "Ahnenerbe" actively engaged "medical experiments". In this area worked Dr. Sigmund Rascher (concentration camp "Dachau"), and Dr. Josef Myung-gel (concentration camp "Auschwitz"). Sigmund Rascher specialized in the research of extreme States of the human body. In particular, he studied the effect of high-altitude conditions on the body, which was placed subjects in a decompression chamber. Or conducted experiments with frostbite. Himmler had in these experiments are of particular interest and twice offered Rusher "deal with animals potential warmth". For this frozen warmed warm female phone Noses Rusher later wrote that "warmth" less efficient than hot tub, except those cases, when there has been sexual contact. Very many of the materials connected with the research carried out in the years 1933-1945 institutes "Ahnenerbe", was gone. In may-June 1945 some documentation was found by the Americans. Archives fell into the hands of the military intelligence of the USA, and their ultimate fate is unknown. But some of the materials still survived. For the first time they are seriously engaged in Pavel and Bergier in 1959, and thanks to their hard work, we now have an idea if not all, of the main directions of activity "Ahnenerbe". You are reading news Аненэрбе охотились за жрецами и хрустальными головами if You liked the article Аненэрбе охотились за жрецами и хрустальными головами, prokomentiruet her.